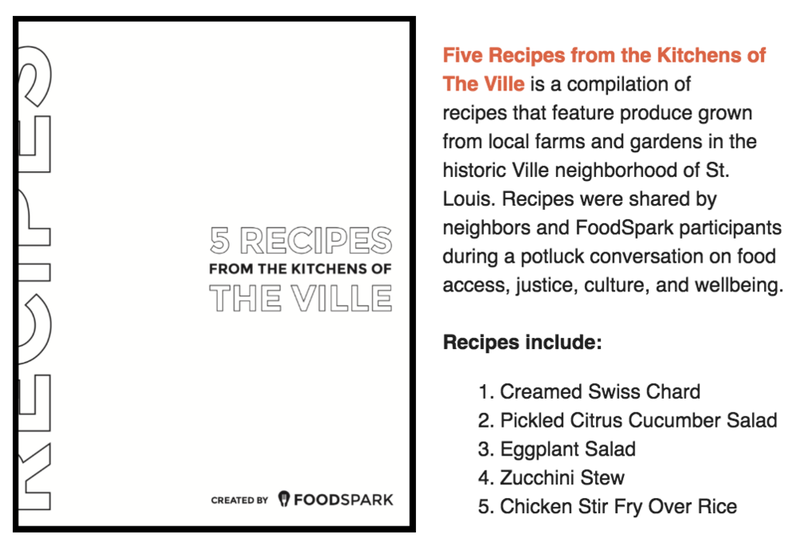 Last month, we kicked off our latest FoodSpark series to engage with members of The Ville neighborhood in St. Louis and discuss how food policies, access, and cultural traditions influence how people within their families and across communities. During our initial potluck, we collected recipes from attendees and community members, and we want to share it with you. Continue conversations at the tables of our FoodSpark community as members host their own FoodSpark gatherings throughout the month of August. Volunteer to host. If you have an idea for how to address local food challenges that are unearthed throughout the series, our Idea Kitchen will help you further develop your idea to pitch at The Spark crowdfundiing party. Join us as we wrap up the Food Legacies series with our crowdfunding dinner party, The Spark. During this catered dinner, changemaking ideas will be pitched, and through the vote of the audience, one creator will receive a microgrant to help grow their idea. FoodSpark is growing, and we want you to join our volunteer-led organizing team as we create new experiences to spark good into the community through food. Current open roles include: co-organizers, graphic designers, digital media coordinators, logistical support, and host coordinators. If you are interested, learn more at foodspark.org/volunteer/ and express your interest. Also, feel free to share with others who might be interested! This FoodSpark "Food Legacies" series is co-organized with Young Friends of The Ville, BJC Healthy Schools Healthy Communities Initiative, Good Life Growing, Missouri Coalition for the Environment, St. Louis Food Policy Coalition, and Northside Community Housing, Inc.